13 Dead End Drive is full of traps and surprises. Aunt Agatha has passed away with no surviving relatives. Now her fortune is up for grabs and all 12 of her friends and employees are waiting to see who will get it. 13 Dead End Drive will have you racing around her house, trying to stay alive as your opponents are setting traps and trying to avoid them. The player whose portrait is hanging on the wall will be the winner of 13 Dead End Drive. Just beware, the mansion is filled with traps for the unwary - a toppling statue, a shaky chandelier, and more. You may have to spring some of these traps to "knock off" your opponents to win the game. 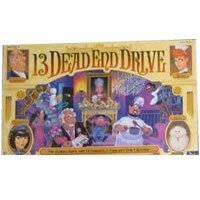 Check out 13 Dead End Drive for a fun game filled with mystery and fun. Your goal is to get your pawn out of the mansion when its portrait is shown hanging on the wall to win. Other ways to win 13 Dead End Drive: If your pawn is the last one alive, you win! Or if your pawn's portrait is shown hanging on the wall when the Detective arrives at the front door, you win the game. Your 13 Dead End Drive game should come with the 13 Dead End Drive game board, 12 character cards, 29 trap cards, 13 portrait cards, 12 pawns and detective pawn, dice, and the 13 Dead End Drive rules and instructions booklet. Please keep in mind that the official 13 Dead End Drive board game rules and instructions could be different depending on the game version you have. The rules below are some of the exact directions on how to play 13 Dead End Drive. Share with us your comments, funny stories, tips, advice, strategies, creative ways to play, questions about how to play, problems with the rules or anything you want about 13 Dead End Drive. All submissions will be reviewed within 24 hours. Click here to add your 13 Dead End Drive comments. I played 13 Dead End Drive with my daughters when they were teenagers and we had a blast! I just recently found this game at a thrift store (all in tacted)for $.99 and bought it. My daughters are now 26 and 30 and we are still having a blast playing it! What great memories and laughs we had and still are having with this game!